Operating on the principle that it's better to buy at wholesale prices than at retail, the General Services Administration has launched a group buying pilot through its recently launched Buyers.gov site. 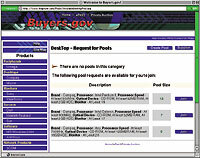 Potential buyers visiting the eFAST section of the Buyers.Gov site can find developing pools for equipment, in this case desktop PCs from Compaq Computer Corp. The idea behind the aggregate buying pilot is fairly simple. 'If you buy 100 items at $100 each, 200 might be $90 each,' Suda said. The site, at www.buyers.gov, helps a buyer who's looking to purchase, say, 50 PCs, join with buyers of another 150'or more or less, depending on what's needed'to get a lower price. The group buying service, offered under the heading eFAST, is one part of what the site offers. Buyers.gov also hosts Private Auctions, where agency buyers can arrange reverse auctions, and Quick Quote, where users can issue requests for quotations, receive quotes and either make a purchase or move the transaction to the auction site. While reverse auctions are designed primarily for large purchases, the eFAST service aims to give a degree of large-volume leverage to buyers of small quantities. There is no minimum on the number of items an individual needs to buy in order to get in on the action'the buyer of a single PC will get the same deal as a buyer of 100 PCs. FTS selected MobShop Inc. of San Francisco to provide the technology for the aggregate purchases. MobShop is one of nine companies signed up to provide Buyers.gov services during the one-year pilot. Buyers can take one of several approaches to the eFAST service. One is to regularly check the site for what's on sale, or coming up for sale. Visitors who click on the link for desktop PCs will find a choice of several vendors. Click on one brand name, and you might find a list of developing pools for servers and desktop units of different configurations. Each item will show how many prospective orders have been placed, and how many are required to qualify for a sale, which MobShop calls a buy cycle. A visitor who clicks on a different brand name may find a sale in progress, listing the products, the closing time for purchases, the GSA price of the item and the current price. Rose said a buy cycle typically will last about three days, with the available time for purchases posted down to the hour'such as 9 a.m. Sept. 11 to 6 p.m. Sept. 13. 'We're trying to do it in less than a week,' he said. The price drops as more buyers place orders. When the purchasing window closes, all buyers will get the final, lowest price, regardless of when they placed their orders. They also have the option during a sale of placing a conditional order that they will buy only if an item hits a certain price, Rose said. Potential buyers can either wait for the items they want to be posted or request to initiate an aggregate purchase. Although the Buyers.gov site operates separately from GSA Advantage, the agency's governmentwide electronic marketplace, Suda said the two can essentially work in tandem for government buyers. 'I think it enhances' GSA Advantage, he said. A customer could, for instance, browse GSA Advantage for PCs and decide on a certain model from Dell Computer Corp. If the buyer's needs are urgent, he could make a purchase right then, Suda said. But if he can afford to wait a week or two, he could move to Buyers.gov and opt to either look for an aggregate buy or arrange a reverse auction, depending on the size of the order. GSA oversees the transactions. 'We have what we call a commodities manager,' Suda said; an FTS employee is assigned to ensure each transaction stays within federal procurement regulations.